Hurricane Harbor, the outdoor water park located next to Six Flags Great Adventure in Jackson, New Jersey, is loaded with water slides and other rides. It's a great place to find thrills as well as cool relief from soaring temperatures. The thrills may not be as intense as crazy coasters such as Kingda Ka and El Toro at the neighboring amusement park, but they will get your pulse racing. Let's run down the water park's best attractions. Note that unlike some other Six Flags locations and other amusement parks, Hurricane Harbor requires a separate ticket and is not included with admission to the theme park (although package deals are often available). If you are looking for parks that offer great value, check out our article, The Best Water Parks Included in Admission to Theme Parks. One of the most unique water slides in the country, King Cobra features a halfpipe finale in which riders race headlong towards the open mouth of a giant snake. Before they face the cobra's fangs, two sets of two passengers race each other in enclosed tubes. King Cobra is almost as much fun to watch as it is to ride. Granted, this is a standard-issue funnel ride found at many water parks (a number of which are called "Tornado"), but it's quite thrilling. Four passengers in cloverleaf tubes plunge down a dark tube and emerge in the funnel where they soar back and forth along its sides. To learn more about funnel rides, read our review of High Anxiety. If you have a healthy fear of heights—and who doesn't?—the 75-foot-tall speed slide, Jurahnimo Falls (do you get the name?) may turn your knuckles white before you take the plunge. Cannonball and Wahini start at the same height, but offer slightly tamer rides in their winding, enclosed tubes. 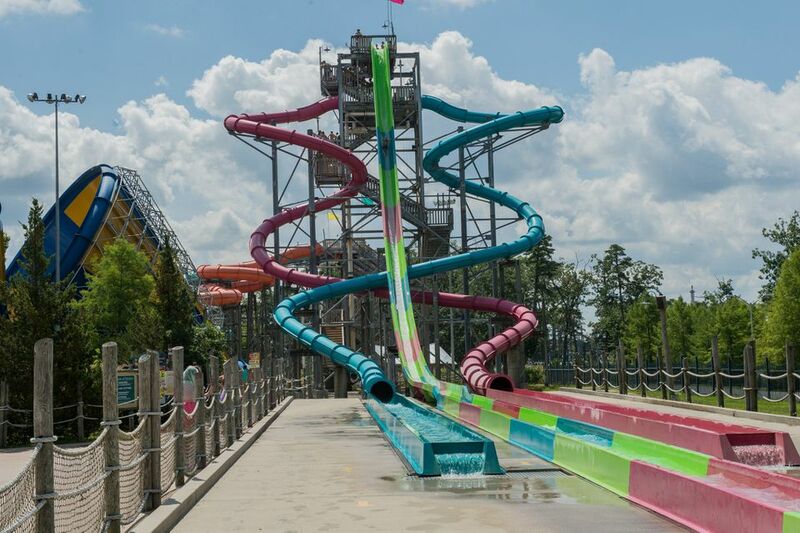 The three enclosed tube slides offer three different ride experiences. The New Jersey names help give the slide tower some local flavor. The six-lane, mat-racing slide adds the element of competition to the fun. With a 42-inch height limit (as opposed to the 48-inch limits on some of the more aggressive rides), even young kids could enter the race. Family raft rides are often among the most popular attractions at water parks, because they allow a gang of passengers to brave the water slide's twists, turns, and drops together. Hurricane Harbor has two family raft rides, Big Bambu and Reef Runner. They also offer a 42-inch height limit, so kids could join their families. This quartet of tube slides pours on the thrills, especially with its enclosed, in-the-dark sections. But they are not so intimidating that most visitors, regardless of their thrill tolerances, wouldn't be able to handle them. Sure, nearly every major water park includes a wave pool. But Hurricane Harbor's Blue Lagoon is especially large, has some nice pirate ship-themeing, and offers decent-size waves. Inner tubes are welcome. Since there is no height limit, even the youngest park visitors could catch a wave. This interactive water play center, which is geared to younger visitors, is jammed with hoses, squirters, and other ways to get wet (and get others wet). There are also some toned-down water slides and not one, but two giant dump buckets that are almost constantly unloading cascades of water.